The Duo started many years back when Sophie and I discovered we shared a lot of musical tastes and there was an immediate connection and telepathy when we played. Duo is a very exposed place to perform but it quickly became one of my favourite formats. When I was 18 I met Sheila Jordan and Harvie Swartz when they hosted a master class workshop at Grant MacEwan College in Edmonton (my home town). I loved the power of their playing with just voice and double bass . I then attended McGill University in Montreal where I studied with Michele Donato who was another superb bassist working in a bass and voice duo featuring Karen Young. I got the opportunity to watch them work up close during rehearsals and performances and that really opened my eyes to how free and intense the work together must be to achieve the simplicity of great performance. I was hooked! As a bassist I have worked with a lot of people, but the Duo is a place I feel very ‘in touch’ with my bass, the music, and my colleague, and it makes me very proud to present our new CD, which captured a couple of fantastic days in the studio (Mattie Foulds’ Mobile With a Home). I think these sessions portray many of the ideals we strive to achieve and the result is fantastic music, performed with love and sounding as beautiful as it can. Our new CD ‘You Turned the Tables on Me’ features the vocals and guitar of Sophie Bancroft and we have visited some of our favorite vocal jazz standards and covered a few of Sophie’s original compositions. Scottish-based Sophie is a new name to me – and a welcome one. She has been playing and recording for over 20 years, but has combined this with raising a family, teaching and work in jazz administration, so perhaps her rather low-key career outside of Scotland is understandable. Having worked in a wide range of musical styles – indie, folk, jazz – her new album has a strong jazz feel. A mixture of standards (Ellington, Jobim, Rodgers and Hammerstein) and self-penned songs, this is a warmly evocative and relaxed set which will please a wide audience. 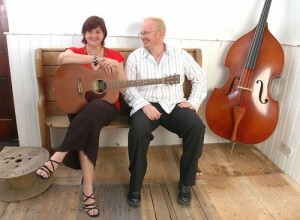 Sophie sings and plays acoustic guitar in a duo with long-time partner Tom Lyne (bass). As a vocal teacher Sophie inevitably displays great phrasing and tone. Her style is reminiscent of Norah Jones or Madeleine Peyroux; though her voice is warm and breathy, it is not particularly distinctive – which perhaps dulls the edge of an otherwise strong performance. The arrangements, however have a gently-swinging jazz feel (on the standards), and a broader folk/blues appeal on the three Bancroft compositions. There isn’t really a duff track – and the subtle guitar and bass backing really enhance the vocals. Standout tracks: Sonny Rollins’ Doxy, Bancroft’s own Just Like the Leaves (especially Tom’s quoting of Autumn Leaves in the intro) and I’ll Love Him Still, and the title-track. Great late-night listening. “With vocals and guitar from Sophie Bancroft and bass from Tom Lyne, the Acoustic Music Centre at St. Bride’s was treated to some stripped-down Jazz music. 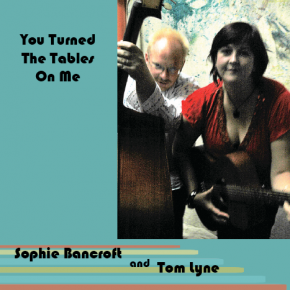 Performing both classic songs and new material, Bancroft and Lyne filled the hour with tracks from their new album ‘You Turned The Tables On Me’ and played older tracks, interspersing the music with friendly anecdotes about the songs and their influence on the musicians. The original pieces were mostly written by Bancroft, who described how her musical compositions were influenced by the likes of Billie Holliday and Doris Day, while her lyrics reflected events in her own life. Covering songs ranging from Sonny Rollins to a jazzed-up version of Robert Burns’ Can Ye Sew Cushions, the pair managed to hold their own against their musical idols, with Bancroft’s voice perfectly blending with Lyne’s incredible finger work on both the double bass and bass guitar. While the songs with just voice and guitar did seem a little too sparse, the performers’ talent was never in question.